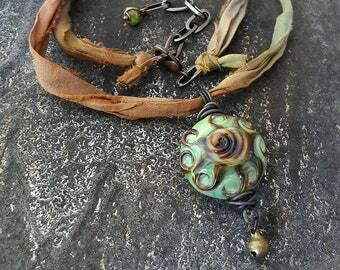 Announcement Lampwork bead jewelry and mixed-media art by Genea Crivello of Third Eye Gypsy. 4-8-19- We are busy preparing for our show at Hagoyah April 26th! 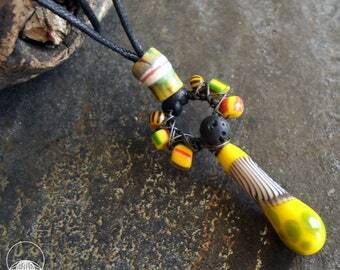 We will be bringing our: handmade lampwork dread beads, festival jewelry for men and women, along with some very special artist collaboration pieces! Can't make it to the show? My work will be on display at the Hagoyah studio through May 26th! We can't wait to see you all there! All of the work in our Etsy shops and webstore are available to purchase in their respective places. 12-5-18- We are proud to introduce our NEW Sacred Chakras lampwork necklaces with matching art boxes jewelry box set. 11-27-18-Introducing our NEW "Flower Lantern" lampwork earrings with matching art box gift box jewelry set! Give the gift of a whole handmade "experience". 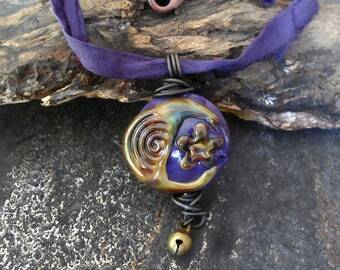 I will be flipping back and forth between adding jewelry to this shop and beads to my other Etsy shop http://www.thirdeyegypsys.etsy.com. So be sure to check both on the regular for all of our glassy goodness! Hello and welcome to Third Eye Gypsy! 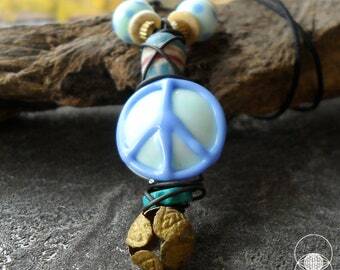 "Enlightened Art for the Awakened Soul"
We create all of our lampwork beads along with artisan jewelry fit for the free spirited gypsy. Let the magic and beautiful of your soul show on the outside. Feel the positive vibrations of our enlightened art. 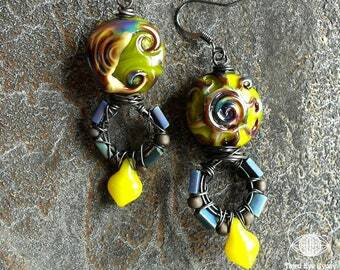 Lampwork bead jewelry and mixed-media art by Genea Crivello of Third Eye Gypsy. Necklace was exactly as described. Great customer service. Will be making other purchases in the future. I love it, amazing person making this, she is super nice and answers all your questions. Her work is beautiful and gets so many compliments. I want to buy everything in this shop :) necklace is awesome and super unique, well made and I’ve never seen anything like it. Seller is an amazing artist, super friendly and just all around awesome, couldn’t have asked for a better experience. Highly recommend this shop!! Each bead starts out with a single colored rod. We make the bead shape and then decorate the glass. We work with soft glass rods and wind the glass onto a stainless steel mandrel that allows us to shape the glass. We create all of our lampwork beads on a torch and then the beads anneal in a digitally controlled kiln. "Enlightened Art for the Awakened Soul"
I've been creative all my life dabbling in many different mediums such as: painting, drawing, sculpture, mixed-media, fibers, metalsmithing, printmaking, and jewelry designing before falling madly in love with glass. In december of 2002 I took a local lampwork class and have been smitten by glass ever since. I began selling my beads at a local bead store where I worked and expanded from there to selling online. In 2016 I re-branded Genea Beads as Third Eye Gypsy since my evolution in my life and art needed a name as expanded as my new consciousness. I love pushing the limits of my medium and exploring the possibilities. 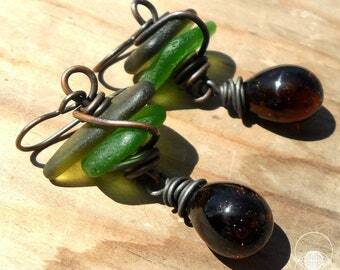 I love making glass pitted and textured to look like beach glass and primitive treasures, Making beads isn't half as exciting as wearing them so I expand my creativity to making mixed-media jewelry as well as mixed-media art. I hope you enjoy my art as much as I enjoy creating it. Each piece is a little part of my soul manifested in physical form to be enjoyed for a lifetime.Won't you come enjoy this journey with me? 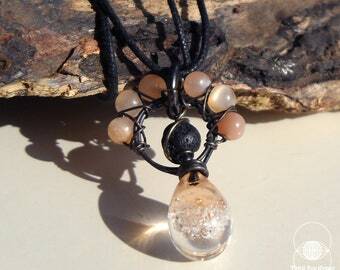 Lampwork bead glass artist with an passion for creating artisan jewelry designs that delight the awakened soul. I enjoy using: form, color, texture, and negative space in my designs. Wholesale inquiries are welcome- Please e-mail me at thirdeyegypsy [!at] gmail.com for more information. Your purchase comes beautifully wrapped in a box with tissue and is ready for gifting. Do not wear your jewelry in: showers, pools, bodies of water, or while sleeping. Do not wear: oils, perfumes, or lotion on your skin where your jewelry will be touching it. Treat your jewelry with care and hang it on a jewelry display or in jewelry box while not in use. Our jewelry made with woolywire is made with natural wool fibers. If wire becomes bent *very gently* bend it back into place.